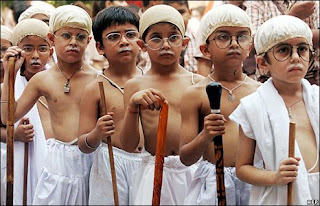 Children dress up as Indian independence leader Mahatma Gandhi during a peace rally in Amritsar on the eve of his 139th birthday. Almost as fun as the Ernest Hemingway lookalike contest. Far more sober, though: the kids bear the slight scowls of perpetually hungry sages. See friendlier shot of Gandhi.